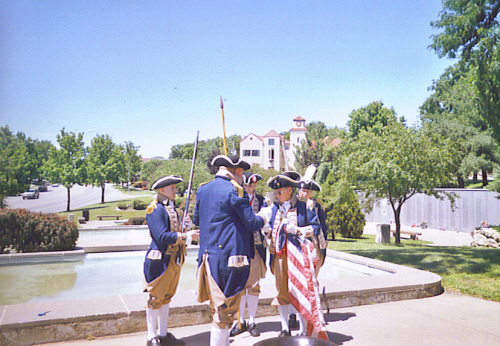 Both the MOSSAR & KSSSAR Color Guard Teams, along with the Children of American the Revolution Corps of Discovery Society in Kansas City, MO participated on Flag Day 2008. The team participated in the Flag Day event located at the Vietnam Veterans Memorial in Kansas City, MO, which honors Vietnam Veterans. In addition, this year’s ceremony allowed the retirement of several U.S. Flags in a respectful ceremony. Left Photo (L-R): Compatriot Dewey Fry, Compatriot Kyle L. Kesler, Compatriot Dirk A. Stapleton, KSSSAR Color Guard Commander Fred Kaffenberger, and Major General Robert L. Grover, MOSSAR Color Guard Commander. KSSSAR Color Guard Commander Fred Kaffenberger, Compatriot Dewey Fry, and Compatriot Kyle L. Kesler are from the Delaware Crossing Chapter of Kansas. 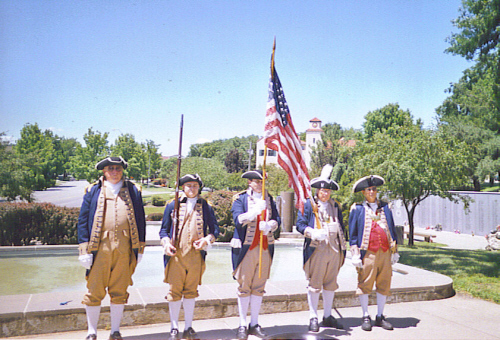 Center Photo (L-R): Compatriot Dewey Fry, Compatriot Kyle L. Kesler, Compatriot Dirk A. Stapleton, KSSSAR Color Guard Commander Fred Kaffenberger, and Major General Robert L. Grover, MOSSAR Color Guard Commander are preparing to retire the colors. 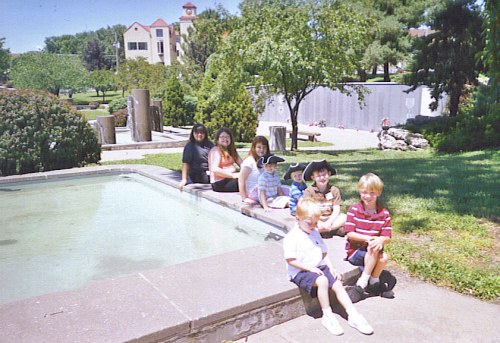 Right Photo: Children of American the Revolution Corps of Discovery Society in Kansas City, MO participated on Flag Day 2008.